My friend Beth Adams of The Cassandra Pages wrote a tender, eloquent eulogy for Marcella Hazan, do read it here. I have been thinking ever since of my discovery of her books in the very early '80s, but equally, of her spirit. Along with MFK Fisher, Marcella Hazan opened my eyes to the arts of the table, to the idea that a three-hour dinner was desirable. It was from Hazan I learned to roast a chicken with two lemons in the cavity, something my Midwestern American mother, who had only ever packed the bird with bread dressing, found fascinating: a bit like cheating, but really good. But my first thought, when I heard that she had died, was, That Tomato Sauce. Its fragrance simmering the stove affected men more powerfully than my perfume (Opium, segueing as the decade wore on to Lancôme's Magie Noir.) I served it with real shredded Parmesan (I was just learning about that, too—no more powdery, tasteless wax in a shaker can) and freshly-baked foccacia. As the years passed, I sometimes thought about cutting back on the butter, but why? Marcella's sauce is an alchemic combination that five-alarms the brain's pleasure center, including that of the cook's, because it returns so much goodness for so little work. Adam Roberts, who writes the ebullient food blog, The Amateur Gourmet, has re-published the recipe, with photos and his own heartfelt homage, here. As Roberts says, "The recipes we leave behind are powerful things." If you could be remembered for one stellar dish, what might it be? Don't laugh but it is a meatloaf dinner. This dinner takes hours to prepare and cook and my husband begs for it on his birthday. As I rarely cook that is about how often he is rewarded with his favorite meal. Because I live with a couple of very picky eaters, and we're all on different schedules, I rarely cook anymore. I used to make a mean moussaka (recipe from Diet for a Small Planet), lentil soup, and one of my favorite summer dishes, tabouli salad (a recipe I picked up in high school from a friend's mother). But since I'm the only one who eats any of these, they aren't really legacy recipes. One of the few things we cook regularly during the summer is a grilled salmon fillet with a lemon/caper sauce drizzled over the top. Simple but delicious. 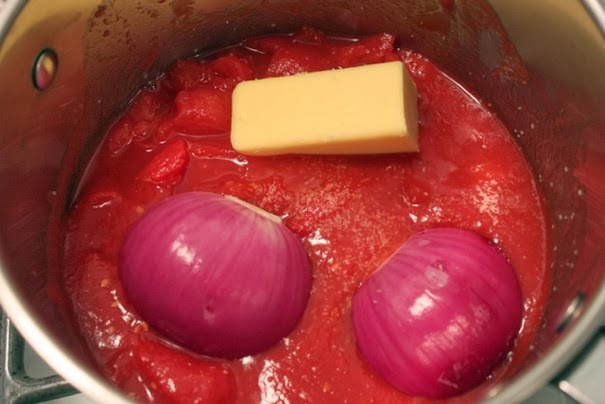 I've always made tomato sauce that way the butter makes it so creamy and the smell is wonderful. I'm afraid to say mine would be burnt toast, I loathe cooking and rarely do it, but I love blackened toast with lashings of butter. While I don't claim to be a great cook, I love cooking. I think it is the process that is so comfortable for me--the measuring, the chopping, the sauteeing, the kneading, the stirring. I even like to grocery shop! Of course it helps that we are a very short distance from a wonderful and large gourmet grocery store. I am probably best known for my homemade breads, my cornbread (including cornbread dressing) ,my chili, and the early morning breakfasts (featuring poached eggs) my husband and I share together while watching Morning Joe. I don't make it often these days, but our younger son always requests that I make Wienerschnitzel whenever he is home. i make excellent macaroni and cheese and mashed potatoes. My children know that I love these things so much that it is hard for me to share. For that reason alone, they will remember those. My son also says that I am the only person in the world who knows the PRECISE OPTIMAL amount of ovaltine to add to milk. I've been using Marcella recipes for almost 30 years. She was apparently a crabby person IRL--and wrote a memoir with occasional crabby moments (feud with Judith Jones, I believe). I'm off to read the links--thanks! I love her recipes. Finding her books really took my cooking and skills up a level or two or three. I was much more interested in Italian cooking than in French! What am I known for? Probably my baking but my kids say they love everything I make which is nice. They are both coming home for Thanksgiving and already putting in orders for food. fmcgmcclic: I adore meatloaf! Would love to try yours. une femme: Often, picky eaters slide gradually toward broader tastes- with dishes like that, who wouldn't? And the most memorable recipes are often simple. Tabitha: You remind me of what my mother often said: "Anyone can be a good cook if she uses enough butter and cream." Susan: Homemade breads! I had to stop making because we all put on weight eating three times as much when the loaf was fresh from the oven! frugal; The memorable foods are often in the "comfort" category and Le Duc's mac and cheese would be on our sons' list, too. I am guessing Marcella was crabby, but also had a big heart, because there is such generosity in her recipes. Nancy K: I just witnessed an adult child drumming on his plate, just poised for a slice of his mother's Thanksgiving pie. He was adorable, suddenly five again- and his mother was delighted to indulge him. Wonderful you are making those longed-for dishes. Duchesse - so funny, when I do putter in the kitchen I always use loads of both, they make everything taste wonderful. OMG, I am so out of the loop! I hadn't heard that Marcela Hazan had died. Your post hits home with me as That Tomato Sauce is one I've made many times as well as the chicken and numerous other recipes (love her soups). The sauce always get raves from everyone and they can't believe how simple it is when they ask me for the recipe! I stumbled upon Hazan's classic book while browsing The Strand bookstore in NYC so many years ago and it has remained one of my treasured favourite cookbooks ever since. We have some legacy recipes in our family, one of which is my dad's stuffing (the kind you don't stuff into the bird). Since my dad's untimely passing 6 years ago, it has fallen to me to make it and has quickly become a cherished family "heirloom." It wouldn't be Thanksgiving or Christmas without it. And I always feel him there with me every time I make it. Oh, thank you so much for posting the link to my blog! Gosh. Dishes to be remembered for? Thai curries, my mother's lemon meringue pie, my mother-in-law's Armenian sambousek...? The New York Times published that sauce recipe when they announced her death, and I tried it and loved it. Imagine -- spaghetti sauce with no garlic and no spices! One of my sons thought it tasted a little more acidic than my usual sauce, though. My signature dish might be one of two desserts from the original New York Times cookbook -- Zuppa Inglese (for birthdays and other special occasions), and Viennese crescents (for Christmas). If I'm remembered at all for cooking, it's probably going to be my blackberry pies -- I'm really good at pastry, thanks to my dad, who insisted that I handle it as little as possible. I remember Marcella Hazan for a wonderful evening with friends, back in the early 90s, when I wowed them all with her bagna cauda. Again, butter played an important role! btw, your usually great writing is particularly evocative today -- a lovely tribute to MH. Anon@2:10: When you make one of your parent's classics, it is as if he is at the table to. And it is not always a sure thing, to get it exactly the same. And oh, The Strand - did you notice it was in "Julie and Julia"? Beth: We must do the grape pie! But have the lemon meringue in reserve in case the grape is only conceptually good. sisty: I suppose the grated parmesan I serve with it adds some base note, as never thought of the sauce as acidic. Zuppa Inglese! What a knockout dessert and labour of love. materfamilias: As one who breaks out in a cold sweat over pastry, you are entitled to boast- it is no minor skill. One of my gfs asked my former mother in law for her pastry recipe. "But, it doesn't taste the same", she said, "I must have left something out." "Forty years of experience", my MIL replied. That is a hard call, I was pondering this while cycling about running errands on yet another beautiful autumn day. Certainly a chicken tagine with preserved lemons, green olives and a bit of saffron. Another good standby is a fish/seafood soup - a "soupe-repas", or unthickened stew, rather than a bouillon or potage. That has plenty of garlic. I also like braising turkey thighs with reduced stock, sometimes adding a bottle of dark beer (St-Ambroise Oatmeal Stout). No, it doesn't taste of beer after a long, slow braise. They taste very rich but aren't fatty. I confess I added a wee bit of garlic when I made the Hazan sauce. She is a good antidote to misuse of garlic and spices, but I find some of her recipes a bit too austere. Beth is spot on about the technique and the clarity - I have quite a few cookbooks from Italy, and Italians sometimes tend to be short on explanations. lagatta: Your descriptions sound absolutely mouth-watering, full of big flavours and fragrances. Tagines are among my favourite dishes. My children (college students) have recently become enamored of the turkey/prosciutto meatballs I started making from the Barefoot Contessa cookbook. In our family we also have a buttercream frosting from scratch, potato salad, baked beans (2 kinds!) and a couple of enchilada versions that are house specialities. None of these could be considered health foods! The one baked bean "recipe" involves 2 pounds of navy beans, a stick of butter, and a box of brown sugar, baked in my Granny's ancient bean pot. I make those about once every other year....getting a hankering for them lately. Mmmmmmmmm. I'm not so much for cooking, but I do enjoy baking. What my family will remember is my Christmas cookies - spritz, pecan sandies, a wonderfully easy coconut cookie, etc. Right now I'm cooking Marcella's "Pasta & Fagioli" for dinner, I got fresh Borlotti Beauties on our local market today. I do cooking most days, everything bought fresh. There is a wide variety in our passion for food, but if I had to choose one thing, it would be LaPasta. If you google Marcella you notice, that she had obviously una grande passione for Pearls! Thank you for such a lovely tribut to her. Marcella's roast chicken with the lemons inside. Have made it for years, now with little variations. I took a one day class with her son in Sarasota lat year--fun and simple cooking. I am making handmade cookbooks of the recipes we have used for my daughters. BIG project, turns out. MJ: So many of the memories involve holiday dishes or "treats"; cookies are often much-loved. barbara: Those are what think of as "meaty" beans, so satisfying. She wore pearls often, usually a multistrand necklace of whites. Lane: A fantastic gift. Reminds me that the young-adult daughter of a dear friend in France carried her mother's handwritten notebook of recipes to the US when she was a student, to make her host family the recipes. her knapsack was stolen and all the recipes lost. Another reason to write them down with multiple copes. We too have bits and pieces of paper with recipes scrawled. You remind me to get this organized. Ah, food. My mother is a food writer, and when I turned 21 she gave me a folder with carefully typed recipes of all my favourite meals from my childhood and teens. I still have it and use it, and I am compiling one for when my kids leave home. Pearl earrings: Something different for L.
What is it about Eileen Fisher? Decoding a "simple life", Part One: Really?